Fredericton, N.B. 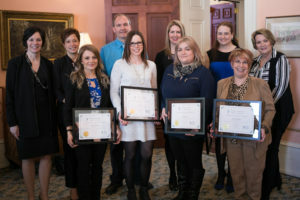 -The New Brunswick Association for Community Living (NBACL) presented eight National Inclusive Education Awards for leadership in Inclusive Education across New Brunswick during a ceremony at Government House today. Introduced by the Canadian Association for Community Living (CACL), the awards recognize individuals, schools, early learning centres, and organizations who work every day to ensure all learners are included in education, school life and their community. The ceremony was organized by NBACL and hosted by the Honourable Jocelyne Roy Vienneau, Lieutenant Governor of New Brunswick. Her Honour Jocelyne Roy Vienneau and CACL President Joy Bacon presented the awards to recipients representing the continuum of inclusion throughout the educational cycle: the owner of a bilingual early learning and child care centre; a School Intervention Worker; an entire class of students at a francophone elementary school; an Education Support Resource Teacher; two high school teachers; a francophone leader in inclusive education for L’Agence Familial et Petite Enfance for the North West; and an instructor with the New Brunswick Community College. Those we are celebrating today join an impressive group of past recipients all honoured for their unwavering efforts to ensure no one is excluded from experiencing school life and learning with their peers. “Thank you to the leaders of inclusive education who we have honoured here today for continuing this work, and moving our schools forward,” said Joy Bacon. Melissa LeBlanc, owner of Mon École/My School, for creating an inclusive environment to allow all children to fully participate. When some children needed sensory supports, she made them available to all children. She finds activities that all children can participate in, removing the barriers from the start. Through a quality grant she received, she made the outdoor play area wheelchair and stroller accessible. Anna Buckley, School Intervention Worker at Fairvale Elementary school in Rothesay, for her leadership in turning Zones of Regulation and Superflex into school wide practices. Each corner of the Zones of Regulation room has a different colour and students go to the corner in the room that represents how they are feeling to practice strategies to help them return to the green zone. Linda LeBlanc and her past group of grade one and two students at École Abbey-Landry in Memromcook for their leadership in inclusion for supporting their classmate Destiny LeBlanc. The students spearheaded a fundraiser, which went viral, to aid in purchasing Destiny a new wheelchair by collecting tabs from aluminum cans. In the end, they collected enough tabs and funds from fundraising and donations to outright buy the $10,000 wheelchair. Kelly Loukes, Education Support Teacher – Resource at George Street Middle School in Fredericton, for going above and beyond for the benefit of everyone in the school, teachers and students alike. She provides opportunities for students to teach one another about their differences, doing a lot of work with students to help them embrace diversity and respect each other. She also focuses on the students’ social and emotional needs because she feels they are sometimes more important in the long run. She has created support opportunities for students who might struggle during unstructured times, and focuses on teaching students how they learn best and how to ask for what they need as a learner. David Taylor, high school math and physical education teacher at St. Stephen High School in St. Stephen for removing barriers to learning in higher academic classes and showcasing Universal Design through his inclusion of a student in both of these classes who is legally blind and using the supports they required with the entire class. Jenny Shea, music teacher at Rothesay High School in Rothesay, who leads by example, treating all students like she wants to be treated. She creates a class environment where everyone is respected and supported. Starting everyone off with the basics and their skill level and then individually pushes them to the next step; she makes sure everyone has the support needed to succeed. She is a leader in the school; when other teachers see that something is working in her class, they will try it in their class. Brigitte LaPointe, executive director at L’Agence Familial et Petite Enfance for the North West for her leadership in inclusive education across Northwestern New Brunswick. Brigitte is active in providing person centered support to the families she supports, going above and beyond to ensure a seamless transition to elementary school. Denise Carroll, instructor at NBCC Miramichi, for consistently showing commitment and passion for inclusive education that is both demonstrated in her teaching and emulated in the students that go on into the Human Services field. As a role model, she exhibits a compassion and understanding for inclusivity that goes above and beyond most people, treating everyone she encounters with dignity and respect. NBACL is a provincial, non-profit organization that works on behalf of children and adults with an intellectual or developmental disability and their families. We work to ensure that people with an intellectual or developmental disability, with the support of their families, have the option to choose the supports they need to live meaningful lives and participate in their communities as valued and contributing members.